Most often, biofuels are seen as being 'carbon- neutral' in that they do not add CO2 to the atmosphere. When they are burned for energy, CO2 is emitted, but it gets taken up again as the new biomass grows, thus closing the carbon cycle and resulting in a neutral balance. This is the commonly held view of how biofuels are 'green'. In an early text, however, we hinted at the possibility of bioenergy doing even more by becoming truly carbon-negative: while using it as a source of energy, make it work as a carbon sink at the same time (in dutch: Bioenergie: brug naar een post-petroleumtijdperk? [*.pdf]). How could this be achieved? It could be done by storing more carbon underground than gets released during the use of the fuels. The way to do so would rely on a technique known as terra preta ('black earth') which is thousands of years old. Ancient civilizations in Latin America and West Africa already used it in forest agriculture, but scientists are still baffled by its effectiveness. And they are trying to find out how it works exactly. It could be the ultimate natural and green carbon sequestration technique. Moreover, there is profit to be made from it. Terra preta not only stores carbon (for which credits with a real monetary value exist today), the rich black earth also boosts crop yields in a spectacular manner. Commonly proposed carbon sequestration strategies face some major hurdles. Technical 'geosequestration' methods consist of pumping large amounts of CO2 deep underground. But these techniques are still under development, and recent evidence suggests that CO2 leakage forms a major problem and could in fact worsen matters. On the other hand, natural methods that store carbon in living ecosystems may be possible in the short term but require huge swathes of land and are only as stable the ecosystems themselves. These strategies would come down to planting biomass and leaving it untouched. An ideal solution, in particular for tropical countries, would consist of combining the quick fix of biological methods with the absolute potential of technical ones, while deriving energy from doing so. Terra preta may offer exactly the basis for such a strategy, as a recent article in Nature reveals. 'Amazonian Dark Earth', or terra preta do indio, has mystified science for the last hundred years. 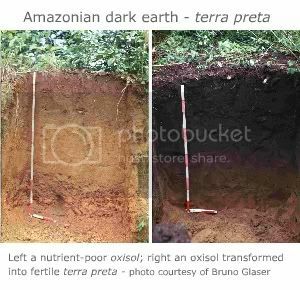 Three times richer in nitrogen and phosphorous, and twenty times the carbon of normal soils, terra preta is the legacy of ancient West African societies and Amazonians who pre-date Western civilization. Scientists who long debated the capacity of 'savages' to transform the virgin rainforest now agree that indigenous people transformed large regions of the Amazon and the West African rainforest into amazingly fertile black earth. Most tropical soils are so-called oxisols that are poor in nutrients and often suffer under aluminum-toxicity (hence their reddish color). Terra preta transforms those soils into black nutrient-rich beds that boost crop yields [picture]. The indigenous techniques remain enigmatic but are believed to have consisted of slash-and-smolder to lock half of the carbon in burnt vegetation into a stable form of bio-charcoal, instead of releasing the bulk of it into the atmosphere like typical slash-and-burn practices. The difference between terra preta and ordinary soils is immense. A hectare of meter-deep terra preta can contain 250 tonnes of carbon, as opposed to 100 tonnes in unimproved soils from similar parent material, according to Bruno Glaser, of the University of Bayreuth, Germany (Terra Preta website). To understand what this means, the difference in the carbon between these soils matches all of the vegetation on top of them. Furthermore, there is no clear limit to just how much 'biochar' can be added to the soil. Claims for biochar's capacity to capture carbon sound almost audacious. Johannes Lehmann, soil scientist and author of Amazonian Dark Earths: Origin, Properties, Management, believes that a strategy combining biochar with biofuels could ultimately offset an incredible 9.5 billion tons of carbon per year -- an amount equal to the world's total current fossil fuel emissions! Biofuels are touted as 'carbon neutral', but biofuels and biochar together promise to be 'carbon negative'. Danny Day, the founder of a company called Eprida is already putting these concepts into motion with systems that turn farm waste into hydrogen, biofuel, and biochar. The Eprida technology uses agricultural waste biomass to produce hydrogen-rich bio-fuels and a new restorative high-carbon fertilizer (ECOSS) ...In tropical or depleted soils ECOSS fertilizer sustainably improves soil fertility, water holding and plant yield far beyond what is possible with nitrogen fertilizers alone. The hydrogen produced from biomass can be used to make ethanol, or a Fischer-Tropsch gas-to-liquids diesel (BTL diesel), as well as the ammonia used to enrich the carbon to make ECOSS fertilizer. We don't maximize for hydrogen; we don't maximize for biodiesel; we don't maximize for char... By being a little bit inefficient in each, we approximate nature and get a completely efficient cycle. Terra preta's full beauty appears in this closed loop. Unlike traditional sequestration rates that follow diminishing marginal returns-aquifers fill up, forests mature-practices based on terra preta see increasing returns. Terra preta doubles or even triples crop yields. More growth means more terra preta, begetting a virtuous cycle. While a global rollout of terra preta is still a ways away, it heralds yet another transformation of waste into resources. How ironic it is that ancient humans cultivated the very fertility of Earth's most pristine places so seamlessly as to be nearly invisible. Perhaps then our challenge as planetary gardeners is not to preserve nature in a bubble but to reweave ourselves into it-to invert our footprints into handprints. -Bruno Glaser's Terra Preta website at the University of Bayreuth. -Johannes Lehmann's Terra Preta de Indio website at the dept. of Soil Biogeochemistry, Cornell University. -A special Symposium during the 2006 Annual Meeting of the American Academy for the Advancement of Science (AAAS) in St. Louis on "Amazonian Dark Earths - New Discoveries" received wide press coverage. Read here. Given the importance of this topic for our project, we add the original article in full below. Copyright, Nature. One way to keep carbon dioxide out of the atmosphere is to put it back in the ground. In the first of two News Features on carbon sequestration, Quirin Schiermeier asked when the world's coal-fired power plants will start storing away their carbon. In the second, Emma Marris joins the enthusiasts who think that enriching Earth's soils with charcoal can help avert global warming, reduce the need for fertilizers, and greatly increase the size of turnips. In 1879, the explorer Herbert Smith regaled the readers of Scribner's Monthly with tales of the Amazon, covering everything from the tastiness of tapirs to the extraordinary fecundity of the sugar plantations. "The cane-field itself," he wrote of one rum-making operation, "is a splendid sight; the stalks ten feet high in many places, and as big as one's wrist." The secret, he went on, was "the rich terra preta, 'black land', the best on the Amazons. It is a fine, dark loam, a foot, and often two feet thick." Last month, the heirs to Smith's enthusiasm met in a hotel room in Philadelphia, Pennsylvania, during the World Congress of Soil Science. Their agenda was to take terra preta from the annals of history and the backwaters of the Amazon into the twenty-first century world of carbon sequestration and biofuels. They want to follow what the green revolution did for the developing world's plants with a black revolution for the world's soils. They are aware that this is a tough sell, not least because hardly anyone outside the room has heard of their product. But that does not dissuade them: more than one eye in the room had a distinctly evangelical gleam. The soil scientists, archaeologists, geographers, agronomists, and anthropologists who study terra preta now agree that the Amazon's dark earths, terra preta do índio, were made by the river basin's original human residents, who were much more numerous than formerly supposed. The darkest patches correspond to the middens of settlements and are cluttered with crescents of broken pottery. The larger patches were once agricultural areas that the farmers enriched with charred trash of all sorts. Some soils are thought to be 7,000 years old. Compared with the surrounding soil, terra preta can contain three times as much phosphorus and nitrogen. And as its colour indicates, it contains far more carbon. In samples taken in Brazil by William Woods, an expert in abandoned settlements at the University of Kansas in Lawrence, the terra preta was up to 9% carbon, compared with 0.5% for plain soil from places nearby1. From Smith's time onwards, the sparse scholarly discussion of terra preta was focused mainly on the question of whether 'savages' could have been so clever as to enhance their land's fertility. But Woods' comprehensive bibliography on the subject now doubles in size every decade. About 40% of the papers it contains were published in the past six years. The main stimulus for this interest was the work of Wim Sombroek, who died in 2003 and is still mourned in the field. Sombroek was born in the Netherlands in 1934 and lived through the Dutch famine of 1944 — the Hongerwinter. His family kept body and soul together with the help of a small plot of land made rich and dark by generations of laborious fertilization. Sombroek's father improved the land in part by strewing it with the ash and cinders from their home. When, in the 50s, Sombroek came across terra preta in the Amazon, it reminded him of that life-giving 'plaggen' soil, and he more or less fell in love. His 1966 book Amazon Soils began the scientific study of terra preta. Since then trial after trial with crop after crop has shown how remarkably fertile the terra preta is. Bruno Glaser, of the University of Bayreuth, Germany, a sometime collaborator of Sombroek's, estimates that productivity of crops in terra preta is twice that of crops grown in nearby soils2. But it is easier to measure the effect than explain it through detailed analysis. Everyone agrees that the explanation lies in large part with the char (or biochar) that gives the soil its darkness. This char is made when organic matter smoulders in an oxygen-poor environment, rather than burns. The particles of char produced this way are somehow able to gather up nutrients and water that might otherwise be washed down below the reach of roots. They become homes for populations of microorganisms that turn the soil into that spongy, fragrant, dark material that gardeners everywhere love to plunge their hands into. The char is not the only good stuff in terra preta — additions such as excrement and bone probably play a role too — but it is the most important factor. Leaving aside the subtleties of how char particles improve fertility, the sheer amount of carbon they can stash away is phenomenal. In 1992, Sombroek published his first work on the potential of terra preta as a tool for carbon sequestration3. According to Glaser's research, a hectare of metre-deep terra preta can contain 250 tonnes of carbon, as opposed to 100 tonnes in unimproved soils from similar parent material. The extra carbon is not just in the char — it's also in the organic carbon and enhanced bacterial biomass that the char sustains. That difference of 150 tonnes is greater than the amount of carbon in a hectare's worth of plants. That means turning unimproved soil into terra preta can store away more carbon than growing a tropical forest from scratch on the same piece of land, before you even start to make use of its enhanced fertility. Johannes Lehmann of Cornell University in Ithaca, New York, has studied with Glaser and worked with Sombroek. He estimates that by the end of this century terra preta schemes, in combination with biofuel programmes, could store up to 9.5 billion tonnes of carbon a year — more than is emitted by all today's fossil-fuel use4. The year before he died, Sombroek helped to round up like-minded colleagues into the Terra Preta Nova group, which looks at the usefulness of using char in large-scale farming and as a carbon sink. The group was well represented at the Philadelphia meeting, although Glaser was not there. Their aim is to move beyond the small projects in which many of them are involved and find ways of integrating char into agribusiness. After all, wherever there is biomass that farmers want to get rid of and that no one can eat, char is a possibility. That means there are a lot of possibilities. One problem is that there is a new competitor for farm waste. Plant are largely made up of cellulose, indigestible material in cell walls. Recent technological advances make it likely that quite a lot of that cellulose might be turned into biofuel. At the moment, ethanol is made from corn in the United States and from sugar in Brazil; if it were made directly from cellulose, producers could work with a wider range of cheaper biomass. Given the choice of turning waste material into fuel or into charcoal, farmers might be expected to go for fuel, especially if that is the way that policy-makers are pushing them: US President George W. Bush promised $150 million for work on cellulosic ethanol in his 2006 state of the union speech. But Lehmann and his colleagues don't see biofuel as an alternative to char — they see the two developing hand in hand. Take the work of Danny Day, the founder of Eprida. This "for-profit social-purpose enterprise" in Athens, Georgia, builds contraptions that farmers can use to turn farm waste into biofuel while making char. Farm waste (or a crop designed for biofuel use) is smouldered — pyrolysed, in the jargon — and this process gives off volatile organic molecules, which can be used as a basis for biodiesel or turned into hydrogen with the help of steam. After the pyrolysation, half of the starting material will be used up and half will be char. That can then be put back on the fields, where it will sequester carbon and help grow the next crop. The remarkable thing about this process is that, even after the fuel has been burned, more carbon dioxide is removed from the atmosphere than is put back. Traditional biofuels claim to be 'carbon neutral', because the carbon dioxide assimilated by the growing biomass makes up for the carbon dioxide given off by the burning of the fuel. But as Lehmann points out, systems such as Day's go one step further: "They are the only way to make a fuel that is actually carbon negative". Day's pilot plant processes 10 to 25 kg of Georgia peanut hulls and pine pellets every hour. From 100 kg of biomass, the group gets 46 kg of carbon — half as char — and around 5 kg of hydrogen, enough to go 500 kilometres in a hydrogen-fuel-cell car (not that there are many around yet). Originally, Day was mostly interested in making biofuel; the char was just something he threw out, or used to make carbon filters. Then he discovered that his employees were reaping the culinary benefits of the enormous turnips that had sprung up on the piles of char lying around at the plant. Combining this char with ammonium bicarbonate, made using steam-recovered hydrogen, creates a soil additive that is now one of his process's selling points; the ammonium bicarbonate is a nitrogen-based fertilizer. "We don't maximize for hydrogen; we don't maximize for biodiesel; we don't maximize for char," says Day. "By being a little bit inefficient with each, we approximate nature and get a completely efficient cycle." Robert Brown, an engineer at Iowa State University in Ames, has a $1.8-million grant from the United States Department of Agriculture (USDA) to fine-tune similar technology, although being in Iowa, he uses corn stalks not peanut hulls. "We are trying an integrated approach: we are trying to evaluate the agronomic value, the sequestration value, the economic value, the engineering," he says. Brown thinks a 250-hectare farm on a char-and-ammonium-nitrate system can sequester 1,900 tonnes of carbon a year. A crude calculation on that basis suggests the US corn crop could sequester 250 million tonnes of carbon a year. At the moment, no one knows how long this could go on; no one has yet found a ceiling for char addition. Stephen Joseph of Biomass Energy Services and Technology in New South Wales has built a number of char-producing machines in Australia that work at fairly large scales (the models have grown from an original 'Piglet' through a larger 'Daisy' to a positively bullish 'El Toro'). Joseph looks for companies with a waste problem such as a paper mill with spare scraps or a dairy with old bedding and manure, and then integrates char production into the business so that the heat produced in pyrolysis is used where the firm needs it. So far, Joseph's company is being brought in to solve waste-management problems, but he hopes the value of the char will become a selling point in itself. For that to happen, however, he needs some help. His machines can be tuned to make char of various sorts: different sized particles with different sized pores and different amounts of other elements. Which is the best? It's a question he asks in Philadephia, and one of the things that Brown's research in Iowa aims to find out. Such technical unknowns are not the only obstacles on the road to a black revolution. One problem is that the purported benefits of char do not slot easily into the framework of the Kyoto Protocol, an international agreement to reduce carbon emissions. Lehmann hopes to see the process get going under the aegis of the protocol's Clean Development Mechanism, in which rich countries sponsor green projects in poor countries and get credit for the reduced emissions. To this end, he is amassing evidence that modern char techniques can actually keep the carbon involved locked up for centuries. His Cornell colleague John Gaunt is working on ways to present the technique as the sort of 'change in practice' that could count as a tradeable carbon-emission reduction of the sort allowed under Kyoto. Then there are your risk-averse farmers. They haven't heard of char. And they aren't going to buy it — let alone buy a strangely named machine to make it — unless they know it will make them money. It is no good pitching it to them with a mouthful of scientific caveats about not knowing the right kind of char for each type of soil or exactly how it works. You have to be able to sell specific benefits and real attractions. "A lot of farmers are environmentalists," says John Kimble, a USDA man who has just retired from the National Soil Survey Center in Lincoln, Nebraska. "But they look at the bottom line, as we all do." After the afternoon coffee break in Philadelphia, Kimble takes the podium and the wind out of everyone's sails. He is sympathetic to the terra pretans goals — indeed he was a good friend of Sombroek's — but that doesn't stop him asking hard questions. "Can you do this in a no-till way?" is one tricky query. Kimble and many others have been pushing no-till farming, which basically means doing without ploughs, as a partial solution to erosion, pesticide run-off and fuel costs. The idea is that the less you mess with the soil, the less its components separate and wander away. But biochar is light and fine, like the black grit left in a barbecue. If you don't physically insert it into the soil, it might just blow away. Everyone listens politely. But while watching their responses, it was hard not to worry that the same enthusiasm that has brought them together might also trap them in a cul de sac. They obviously respect economics and pragmatic requirements. But these are not people principally moved by practical politics or bottom lines; they are people moved by ideals. They start from the basis that the answer lies in the soil, more or less whatever the question is, and can't quite understand why this isn't self-evident to everyone else. Faced, for example, with the suggestion that all corn matter be turned into ethanol, they tend simply to say "Well it could be — but we hope, of course, it will go into the soil." They know they ought to be marketing terra preta as a resource, or a policy instrument; but they can't stop seeing it as a wonder. Policy is not always, or even often, dictated by pure rationality. Perhaps terra preta's compelling history and rich, earthy smell will go to the heads of that diffuse band of policy-makers who hand out the cash. The enthusiasts need to be more down to earth; but the policy people might benefit from getting their hands dirty. 1. Woods, W. I. & McCann, J. M. in Yearbook Conf. Latin Am. Geogr. Vol. 25 (ed. Caviedes, C.) 7–14. (Univ. Texas, Austin, 1999). 2. Glaser, B. Phil. Trans. R. Soc. (in the press). 3. Sombroek, W. G. Interciência 17, 269–272 (1992). 4. Lehmann, J. , Gaunt, J. & Rondon, M. Mitigation Adapt.Strateg. Global Change 11, 403–427 doi:10.1007/s11027-005-9006-5 (2006).